The natural moisture surrounding most structures easily get into the walls and this is called rising damp. Our decades’ long experience helps you with innovative solutions for arresting rising damp. Rising damp, a phenomenon that is effusively explained by the rules of physics has been a matter of concern in architecture since antiquity. The Building Research Establishment (BRE) in its documentation declares rising damp as a major setback. 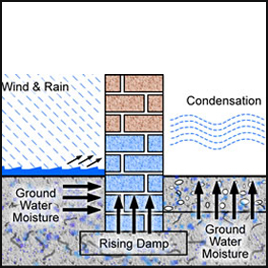 The third part of the “Building Regulations for England and Wales” explicitly advises the incorporation of rising damp protection in all newly constructed buildings. The first stage in diagnosing rising damp is to look for stagnant water. Removing standing water with suitable drainage will get rid of any type of dampness. If dampness remains even after this step, the next thing is to check the presence of existing damp proofing, if any. If some type of damp proofing exists, it is likely to be malfunctioning, as the materials used in damp proofing may not have had sufficient lifespan. It should be accepted that there are instances where early damp proofing methods have failed for various reasons. Get in touch with us today for a proper diagnosis and the apt solution to control rising damp in your home.